DEDHAM, Mass. 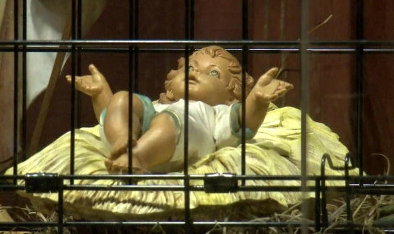 — Baby Jesus is in a cage and the wise men are closed off by a wall in a nativity scene at Saint Susanna Parish in Dedham, Massachusetts, CBS Boston reports. The display is meant to be thought provoking. "We try to take a picture of the world as it is and to put it together with a Christmas message," said Pastor Fr. Stephen Josoma. This year, the message questions "peace on Earth," since Jesus represents migrant children being held at the southern border, separated from their parents. The wise men represent a caravan of migrants behind the border wall. Those at the church believe it's very much the message of Jesus. "Jesus was about taking care of one another. This is not the way to take care of one another," said Josoma. "We're not trying to scandalize anyone," said parishioner Pat Ferrone, a member of the Pax Christi committee which came up with the idea for the display. "We're trying to reflect back a reality that has to be looked at." But mixing politics with religion isn't sitting well with some who believe the nativity scene crosses a line. "This is where you come to pray. This is not where you come to be preached at about what you should think about politics," said Helen Watson, who drove to the church to see the display. Parishioner Phil Mandeville said Jesus was no stranger to politics. "Christ was political. He was hung on a cross for making political statements and bucking the authority, and that's exactly why he died," Mandeville said.